You’re zooming through life, tackling the day-to-day responsibilities that eat up chunks of your time. In the midst of carrying out your usual routines, you find yourself falling short in some areas – one of them being your oral care. Since you’re burning the candle on both ends, you may sometimes miss that second session of toothbrushing or preventive care from your dentist, realizing that these aren’t the healthiest habits. As a result, you may have developed cavities, but how could you know for sure? Do they hurt? Are there any visible signs? These and other questions will be answered as you continue reading. Cavities are holes that are created from hundreds of bacteria that have formed into plaque, a sticky, clear substance that settles on the teeth and gums. This detrimental stew then releases acids that eat away at your teeth. Initially, cavities only permeate the enamel, the outer layer of your teeth. If, however, they are not addressed, they will continue to go deeper through the inner layers – the dentin, pulp and roots. When a cavity first starts to develop, you won’t feel any pain because your enamel doesn’t have any nerves. Therefore, if you start to feel pain related to a cavity, it is because it has at least penetrated the more sensitive dentin. Severe pain may be a sign that the cavity has gone even further into the pulp, where the nerves of the tooth are housed. 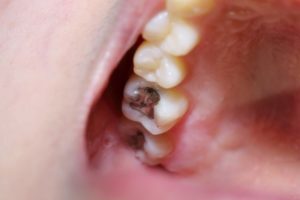 Are There any Visible Signs of a Cavity? Depending on the size of the cavity, you may notice the hole where bacteria entered the tooth. Another visible sign you may notice is black or brown staining. Thankfully, you’re not doomed to suffer with cavities; they can be prevented. Brush your teeth at least twice a day to remove food particles and bacteria from your teeth, tongue and mouth. Using a toothpaste containing fluoride will also aid in fortifying your enamel. Flossing is equally as important as brushing your teeth, as it removes 40 percent of the food and bacteria from the surface of your teeth. Its greatest asset is its ability to go where no other apparatus can. Be careful with what you place in your mouth. Snack foods consumed in an abundance will lead to tooth decay from the excess sugars and other chemicals. But healthier foods like fruits and vegetables have natural tendencies to fortify your teeth by enhancing your saliva. The saliva then coats your teeth to protect your enamel. Visit your dentist at least twice a year to make sure that your teeth are not under attack. If he finds signs of tooth decay, he can quickly address it, so that the problem doesn’t spread. To enjoy the benefits of being more proactive about your oral care, reach out to your emergency dentist in Orange Park today to schedule your first visit for a thorough cleaning and examination. Dr. Matthew Nawrocki earned his DMD from the University of Florida College of Dentistry. He followed that by acquiring his MS in Dental Science and has since gone on a quest to help each of his patients fight bacteria and tooth decay. Dr. Nawrocki can be reached for more information through his website.